The ultimate healthy comfort food. Lightly spray a large frying pan with oil and cook the onion, leek and garlic, stirring occasionally, over a medium heat for about 8–10 minutes until softened. Add the mushrooms and cook, stirring occasionally, for 5 minutes until golden brown. Add the wine or stock and cook for 5 minutes or so until it reduces. Stir in the crème fraîche and lemon zest (if using) and season to taste. Meanwhile, cook the pasta in a large saucepan of boiling salted water according to the packet instructions until it’s just tender (al dente). Don’t overcook it – it should retain a little bite. Drain well. Return the drained pasta to the hot pan in which it was cooked and stir in the spinach. 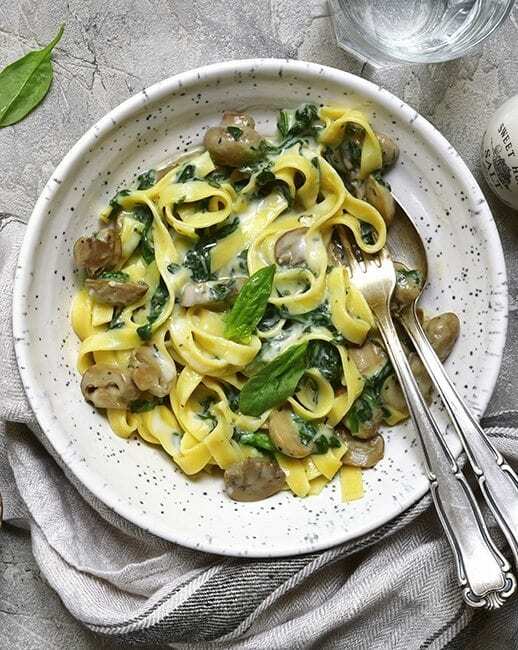 When it wilts and turns bright green, gently stir in the creamy mushroom mixture. Divide between 4 serving plates and serve immediately, sprinkled with Parmesan. If you enjoyed this recipe, try our Speedy Tuscan Spaghetti.